Sometimes educators have to dish out advice that families simply don’t want to hear. 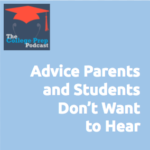 In this episode, Megan and Gretchen detail their most unpopular advice for students and parents. Course Selection: You need to take more courses than you’re planning on. How Long Change Takes: I can’t make your student perfect right away. It takes time. College Admissions: You’re clearly not going to be admitted. Adjust your college list. Daily Note-Taking Habits: You’re going to need to spend some time honing your notes after every lecture. Writing in Planner: Yes, you need to write things down on paper, even if your school keeps all your assignments online. Although parents and students often don’t want to hear it, this is the best advice we have! Tune in to hear the details about what exactly the advice is and why it’s importance for parents and students to take heed.